Like with hardwood floors, you can install laminate floors yourself or hire someone else to do it. If you want your floors to last a long time, you hire a professional who takes pride in their work, you hire me. 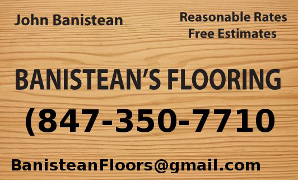 If you want laminate floors that look good for a long time but don’t want to pay a lot, you call me. Call me now for quality yet affordable laminate floor installation: 847-350-7710. You can call me too for hardwood floor refinishing in Chicago and suburbs too. Because I have refinished many floors and have happy clients you can talk to about my work. Because, sometimes, refinishing existing hardwood floors is a better option than installing laminate floors. Call 847-350-7710 now to get your free, no-obligation written estimate. Copyright 2016 www.hardwoodfloorinstallationchicago.com. All rights Reserved.